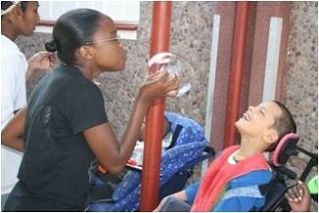 Spiritual care: two care centres of Edenvale (Domitilla and Danny Hyams Home) and Bapsfontein (Elvira Rota Village). Domitilla wanted the chapels to be built and consecrated to provide spiritual assistance to the residents and staff of LITTLE EDEN Society, to welcome visitors and benefactors in prayer and to serve local communities. With the passage of time, the community of LITTLE EDEN Society has crossed South African borders and people from all over the world now visit the institute. Domitilla’s heartfelt desire to have an order of nuns at LITTLE EDEN Society was finally realised after many years. Religious Sisters (currently six nuns) from the Sisters of the Imitation of Christ (SIC) have settled at LITTLE EDEN Society and provide spiritual and other specialised care. With them, Christ and Our Lady are even closer to those who reach out to LITTLE EDEN Society. With them Domitilla's spirit is not waning, but rather growing from day to day. LITTLE EDEN Society hosts altogether 300 residents: 180 at the Domitilla and Danny Hyams Home and 120 at Elvira Rota Village. All residents have severe, profound intellectual disability. Their average physical age is 20 years. Their average mental age is below 1 year. The youngest resident is 4 years and the oldest resident turned 65 years. LITTLE EDEN Society has 257 members of staff working in shifts 24 hours per day, 7 days a week, 52 weeks a year; 2.500 nappies are washed daily – even on Christmas day and 3 tons of linen and clothing are also washed every day. Special days: concerts, outings, birthdays etc. Groups of friends, both local and overseas, constantly visit LITTLE EDEN Society to work with the residents. Domitilla used to say that each one of us is called to be the hands of Jesus. There are facilities for long-term overseas volunteers and the cottage at Bapsfontein is named after Barbara Mazzoleni, the first volunteer from Bergamo visiting LITTLE EDEN Society and which subsequently activated the enthusiasm for such an extraordinary life experience that beckons each one of us. per 300 residents per annum. The amount of R 3.413 (about EUR 245) per resident from the Gauteng Provincial Government Department of Health (GPGDoH) represents approximately 31% of this cost. 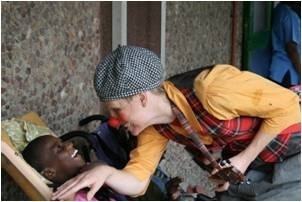 A limited number of residents also receive a disability grant of R 1.500 (about EUR 107) per month. The shortfall is met through specific appeals to corporate donors, The National Lotteries Commission (NLC), the annual fête, corporate functions and other events, direct mail campaigns, a second hand shop operation and the generosity of the public, individuals, schools, churches, service clubs as well as small and medium business enterprises. The NPO embraces the values that LITTLE EDEN Society has identified as core to its existence. The employees of LITTLE EDEN Society, benefactors and friends identified three key value pillars which underpin the development of, and what LITTLE EDEN Society stands for. Respect those around us: for families that abandoned their children, for those who do not care. Domitilla never judged anyone. "It is not up to me - she used to say - I do not know anything about them." Sanctity of life: this is Domitilla's manifesto, the manifesto of one who fought to save every life, from the time of conception to the point where everyone said there was no hope anymore. Domitilla, as Holy Mother Teresa, has not "healed" anyone, but she has "saved" everyone. Love & care represents the hallmark for those who reach out to the children of LITTLE EDEN Society, and now to the NPO as well. No one asks to do the possible, but the impossible in the context of human limitations confronting illness. If a medication does not yet exist, there is a caress. To be human is to know that there is no limit to love. 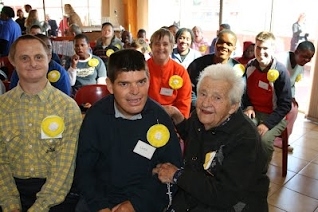 LITTLE EDEN Society was founded in 1967 by the late Domitilla and Daniel Hyams who gathered together people of different social and religious communities to discuss the idea of helping profoundly handicapped children and give them love. The mission began with 10 Rand and three little girls in day care. 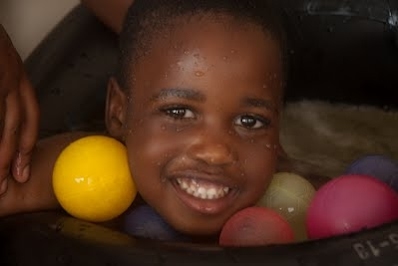 After 13 moves in the first 9 years of its existence LITTLE EDEN Society finally settled in Edenvale, in the facilities now renamed the Domitilla and Danny Hyams Home. In 1992 Domitilla inaugurated Elvira Rota Village in Bapsfontein (named after her mother). At the village, as she used to call it, everything is organized according to a typical farm environment where the residents spend much time outdoors. Farming operations include nut trees, crops of beans and aromatic herbs. The wetlands has been restored using a sewage treatment system. A large chapel called “The Holy Family Chapel” has been erected, donated by a local Italian benefactor. This home hosts residents who are more able and can cope better than those at the Domitilla and Danny Hyams Home.